Jon Dunham, Key Account Manager at C&B Equipment recently had an online presentation with the Water Environment Research Federation to present key highlights of the Direct Inline Pump System.® Since 1889, C&B Equipment has been a major supplier of pumps and compressors to the water sector. C&B Equipment has recognized a need in the wastewater industry in North America of which they are able to fill. Most municipal managers will attest that their greatest costs of doing business lie within labor and energy. With the Direct Inline Pump System® wastewater maintenance costs can be greatly reduced with pumps that clean themselves without human intervention. There is no more need for a Vac-Truck to perform wet well cleaning (just one of the few perks and savings of using the DIP System®). Want to forget about the “flushables”? Now you can. There will be no more need for trash baskets or bar screens and rakes, not to mention, regular cleaning and trash hauling from debris in traditional wet wells. Lift stations are now managed, not just monitored, with a smart phone, tablet laptop or desktop, saving time and money for municipalities. The Direct Inline Pump System® pump(s) are controlled by a sensor that continually measures the inflow and adjusts the speed of the pump to meet the required flow. If flow stops, the pumping will stop. 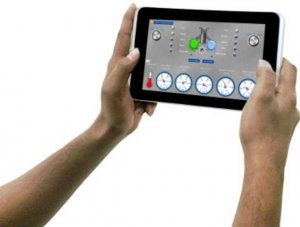 This electronic innovation assures greater efficiencies in managing energy costs. 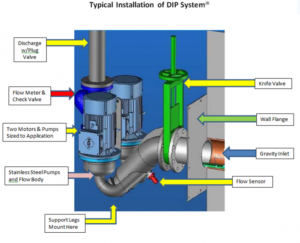 Overall, The DIP System® offers true removal management of lift stations, reduces the costs of labor associated with wet wells and provides a clean work environment. For more information, give Jon Dunham a call at (913) 438-1212.